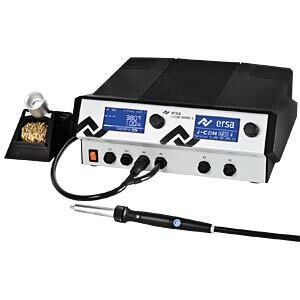 The multi channel soldering and de-soldering station i-CON VARIO 4 meets the highest standards of professional soldering and desoldering. The flagship of the i-CON-family gives the user four soldering tools for demanding soldering tasks. 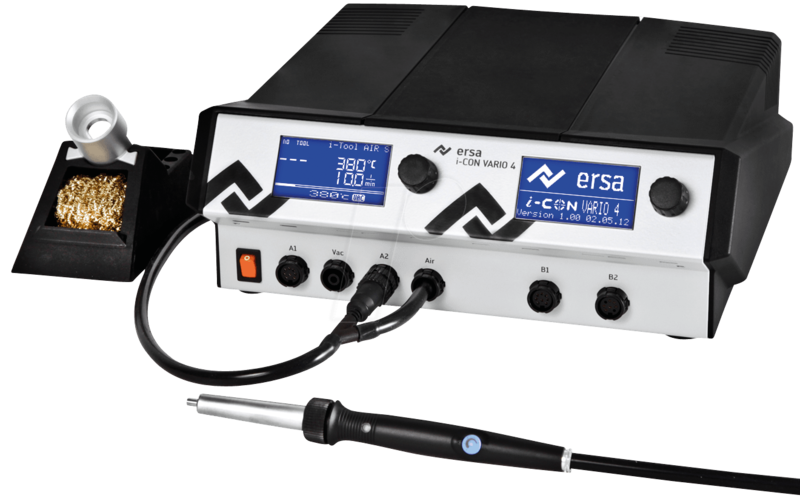 As with the rest of the i-CON family, the compact, ESD-safe power supply unit offers easy and straightforward operation. Interfaces to Ersa fume extractors and pre-heating plates are included as a matter of course, as well as the simple and safe configuration of the station via a microSD-memory card. • Calibration function: adjustment of the actual tip temperature to the displayed temperature. Ergonomic handling, powerful performance! That’s the best way to describe the i-TOOL AIR S. The slim, lightweight handpiece has a 200 W heater cartridge, which allows fatigue-free working with a variety of SMD-components. The volume of hot air can be easily adjusted directly on the handpiece; the current air flow (2 to 20 l/min) is visible on the display of the i-CON VARIO 2 or 4. The air flow can be metered precisely for soldering the smallest chip resistors. Different nozzles can be used for the optimum heating of the components. A motion sensor activates the I-Tool AIR S when removed from the stand with an IR-sensor in the handle, it can be turned on and off without touching a button.